Una campaña mas que divertida. No hay mucho más que decir … BAFICI ( Buenos Aires Festival Internacional de Cine Independiente ). Este fin de semana pude ver esta película que sin dudas, no me defraudó. Hacía tiempo que venía escuchando noticias al respecto y navegué en la Web donde te podías informar sobre el campus universitario, tener acceso a la sección de merchandising y darte una pequeña idea de lo que podía llegar a pasar en la película. Como todos sabemos, esta precuela llegó para aclararnos un poco de dónde salen esos personajes que nos conquistaron en Monsters, Inc. (2001). Uno de los mensajes que más me gustaron fue el de Mike Wazowski, un monstruo estudioso que tenía muy en claro cuál era su objetivo. Eso mismo que nos pasa cuando escribimos una meta, la tachamos en el calendario y comenzamos un camino que sin importar lo que nos digan … alcanzaríamos. La película es una oda a la amistad donde chicos y grandes van a reírse por varios meses más. Antes de llegar al cine, había algunos corpóreos de la película donde podías poner tu cara y sacarte una foto como si tuvieras el carnet para entrar a la universidad de MU. 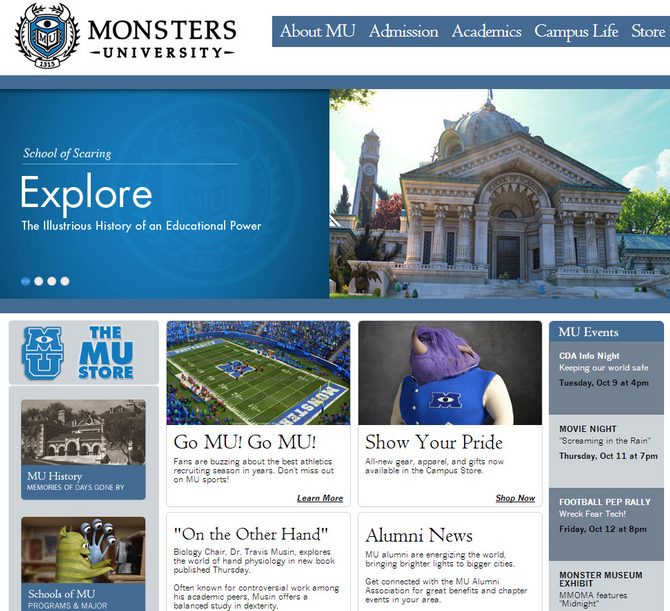 Los pueden seguir en facebook: https://www.facebook.com/PixarMonstersUniversity, twitter: https://twitter.com/MonstersU, pinterest: http://pinterest.com/disneystudios/monsters-university/, instagra: http://statigr.am/tag/monstersuniversity, etc. Para que nos demos una idea, esta es una película que más allá del éxito asegurado … viene haciendo campaña en redes sociales/internet desde le 2010. Saquen sus propias conclusiones! With the rise of social media like Twitter, Facebook, Instagram, Pinterest, Reddit and what not, also comes the rise of the so-called ‘social media experts’. People who surf on the wave of the hype, presenting themselves as gurus, imams and dominatrices of social media. They are the ones standing there with their nifty social whip, ready to give some expert spanking. So what kind of social media experts roam the digital marketing universe? Letʼs break this down from a Star Wars point of view. This social media ‘Jedi Master Influencer’ is highly respected by others in his field. He is creative, wise and powerful. He expresses his beliefs and opinions courageously online, because he is comfortable and secure about his expertise in his field. He is the most powerful of all. He is not afraid to stand alone, if it’s for the things he beliefs in. You either worship him or hate him. People take his opinion seriously and he has somewhat of a stardom status. He prides himself for not being a follower. He switches from being a networker, to influencer and tech geek at will. This social media ‘Obi Wan Kenobi Teacher’ is trained by The Jedi Master Influencer. His talent lies more in the knowledge aspect of things than in the engaging way of speaking and expressing. He says the things he needs to say online, with a clear purpose. To teach. He analyses, oversees and then decides carefully what the best strategy is. He collects content online and compiles it for his community. He is cautious, focused, consequent and somewhat traditional. He only takes risks when it’s necessary and when there is a lot at stake. This social media ‘Darth Vader Pretender’ has befallen to the dark forces of commerce. He used to have a heart but then trauma made him turn into a commercial bad guy, who will stop at nothing to make money. Including posing as a social media expert. He has never really put the time and effort in mastering the craft other then just pretending, to gain more power and money at all costs. Even if that means polluting the online landscape for purely short-term financial gain. This social media ‘Han Solo Explorer’ is consumed by the overwhelming sense of exploration and adventure. He is curious, fearless and learns by doing, falling and getting up. Han Solo is temperamental, considered something like a misfit. He may seem untrustworthy but is likable and in essence has a heart of gold. During the course he learns to share and express himself in a way that matches his chore. Evolving is Han Soloʼs main keyword. These social media ‘Storm Troopers Followers’ are following the crowd. They usually are harmless and do what they have been told without thinking for themselves. They usually need an authority figure around that tells them exactly what to do. There is no room for creativity. Quantity usually trumps quality. The main part of the social media landscape and users consists of Storm Troopers Followers. The moral of this story is when dealing with social media experts, make sure you side with the people who win wars, not just battles. Work with leaders. Not followers and pretenders.